Buying Advice: 😐 Nice Single Malt. The regular 16 Y has a better P/Q ratio. Nicely matured Islay Malt. The PX Finish gives it a bit of extra Sweetness. A few Sour, Herbal, Rubbery and Dusty Aromas. Quite pleasant and Medium-Dry. This Lagavulin would shine even more if bottled at 46%. 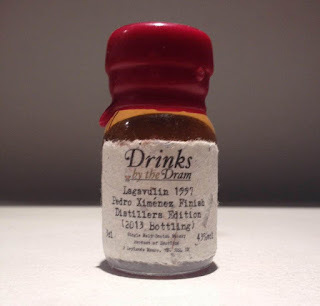 Toasted and Malted Cereals, Burnt Toast, Treacle, Brown Sugar, Heather-Honey, (Cigar) Smoke, Peat, Iodine, Dried Fruit like Raisins, Plums and Figs, Seville Orange, Cinnamon, Pepper, Leather and Tobacco. Toffee, Vanilla, Soot, Tar, Brine, Salted Ham, Bacon on the BBQ, Lemon, Wax, Red Apples, Maraschino Cherries, Roasted Coffee, Dark Chocolate, Cloves and Menthol. A little Thin. An ABV of 46% would have been more adequate. On the Palate, the PX Finish is Bitter-Sweet with a few Salty, Mineral and Grassy notes. 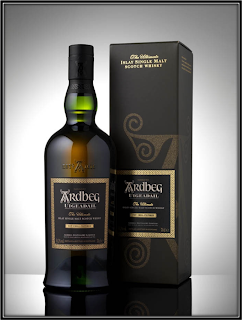 Toasted/Malted Cereals, Heather-Honey, Treacle, (Cigar) Smoke, Peat, Iodine, Tar, Soot, Ashes, Smoked Fish and Bacon, Dried Fruit like Raisins and Figs, Oak, Dark Chocolate, Leather, Pepper, Menthol and Licorice. Vanilla, Salted Caramel, Nuts, Red Apple, Dusty Track, Wet Rocks/Sand, Herbal Tea, Roasted Coffee, Lemon, Tobacco and Cloves. Middle-Long, Bitter-Sweet and Medium-Dry. I find Toasted and Malted Cereals, Toast, Treacle, Caramel, (Cigar) Smoke, Peat, Iodine, Ashes, Soot, Tar, Salted Fish and Bacon, Wet Stones, Dried Fruit like Raisins and Figs, Dark Chocolate, Oak, Seville-Orange, Roasted Coffee, Leather, Tobacco, Licorice, Pepper, Cloves and Menthol. I added a few drops of Water and the Nose becomes more Malty and Peaty. More Salty Bacon and Spices on the Palate and in the Finish. I liked it both ways but be sure to add only a few drops. Otherwise you will drown this Lagavulin. Good. It deserves an ABV of 46%. 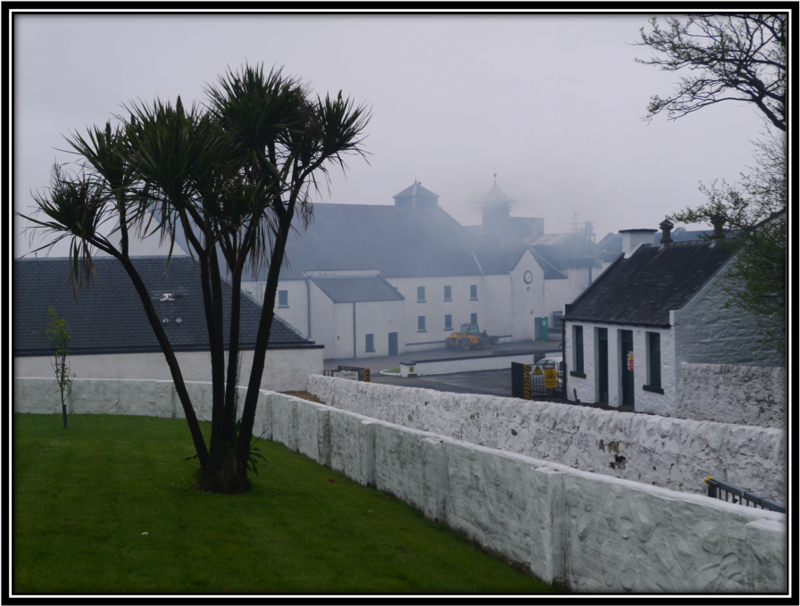 The distillery was founded in 1816 by John Johnston and is located on the South-Eastern coast of Islay, close to Port Ellen. It changed hands various times during its history but today it is firmly controlled by Diageo. Lagavulin currently produces around 2.5 million litres. 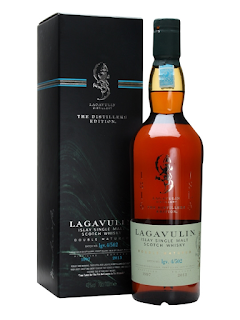 Lagavulin is one of the key Malts in the White Horse Blend. This PX Finish was launched for the first time in 1998 and it has become an annual crowd-pleaser. The edition I'm tasting today was distilled in 1997 and bottled in 2013. 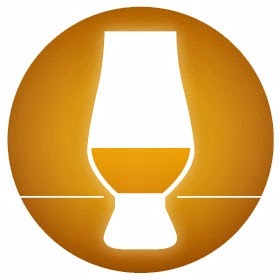 It's a nice and balanced Single Malt although the ABV is slightly on the low side. An ABV of 46% would be perfect for this Malt. My problem with this Single Malt is the price. Because in reality it's just the regular 16 years with a short PX cask Finish. This short Finish makes this Lagavulin a little Sweeter but its Price Tag quite Salty! I can easily live without both. 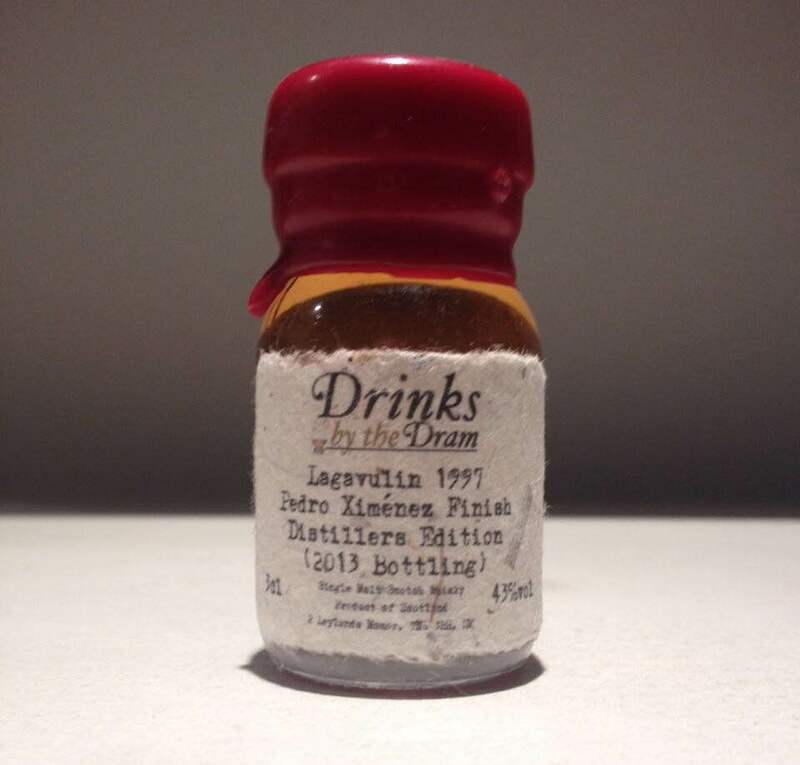 The Lagavulin PX Finish Distillers Edition is a nice Single Malt but the regular 16 Years has a much better Price/Quality ratio.